After leaving Montevideo I travelled by bus, seven hours north, where the group was met by our host for the next few days, Juan aka Gaucho 1. We then threw the bags onto the roof of his truck (or rather then guys threw the bags up and the girls attempted to be helpful mainly by staying out of the way). It was then another hours drive to reach Estancia Panagea, his ranch. The drive was quite fun as the truck just has benches in the back and there was a great view of the sunset and then the amazing stars as we trundled down country lanes and across creeks. 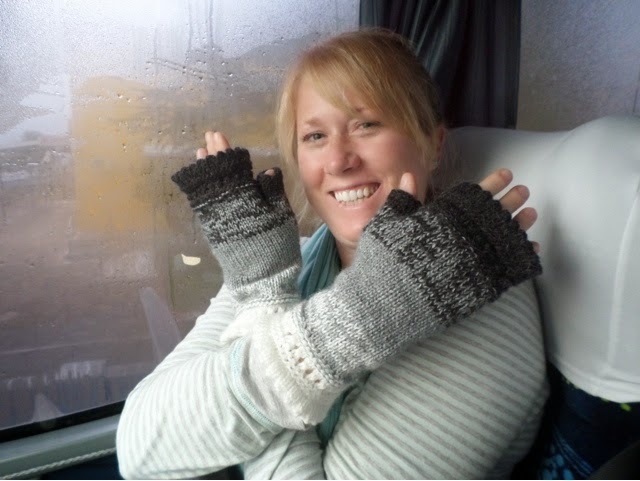 The first bus journey had actually been pretty productive as I had also managed to finish the gloves that I was making for us to give to Michelle as her birthday present. I think they turned out pretty well. The ranch is owned by Juan’s family and he lives there with his wife, Suzanna, who is Swiss-German and their two daughters, who are really cute. Juan and Suzanna met whilst travelling and afterwards he wrote her letters for several years until she moved over to Uruguay and they got married, it’s quite romantic really. 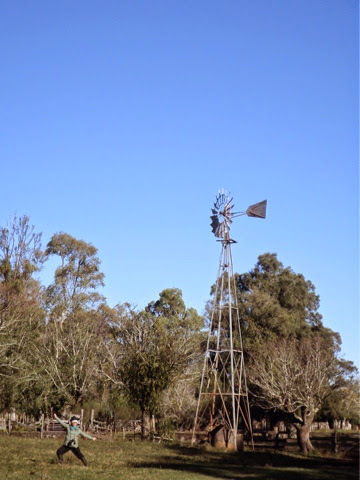 They’ve been operating home stay visits for tourists for 14 years now and the idea is to get stuck in to the day to day activities, so you get an idea of what life is like on a working farm here. 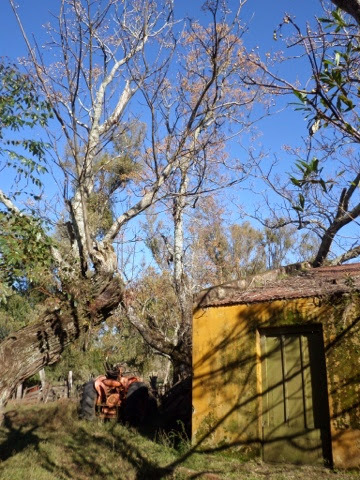 Another couple also live there in a other house, the man Bilinga is also a gaucho and seems to do most of the day to day running of the ranch, Juan refers to him as Gaucho 2. We all stayed in group rooms which was quite fun, as we had all the girls in together. 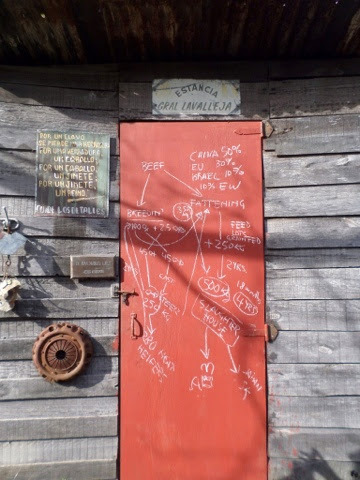 The house is actually Juan’s family home, you’re not off in other buildings, so you truly are in the middle of the working farm. 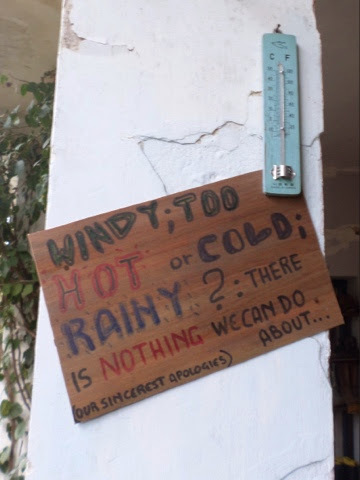 They don’t have proper plumbing so you have to get water in a bucket from a well at the back of the house to flush the toilet, not a novelty in the night when it’s cold and dark ha ha. They are also too remote to be attached to the grid so their electricity comes from a generator which operates for three hours each evening. In the kitchen they have a great old wood fired iron range, which I loved. It was really nice to be welcomed into their home, they are truly wonderful people. Suzanna is also a totally insane cook, I think we all put on a lot of weight during our stay! She made you feel so welcome and spent a lot of time chatting with us all, she was really like a house mother :-). The ranch farms cattle, specifically veal and lamb. They still use horses for all their work, rather than ATVs, which are now so popular on Australian farms. 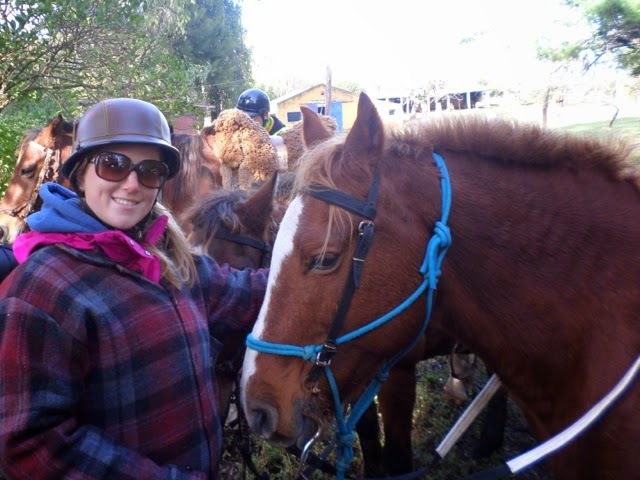 Therefore our first activity was to meet our horses, learn how to saddle them gaucho style and to head out on an orientation ride to get used to them. My beautiful horse for the next few days… Can I keep him pleeeeease, I promise I’ll be good! Saddling a horse gaucho style is not dissimilar to elsewhere, firstly you cover the back of the horse with a woven mat, then a fabric cover. 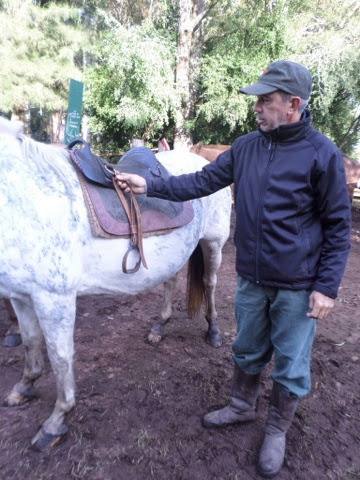 You then put your saddle over the top and fix it in place using a wide leather belt that you fasten as tightly as you can, avoiding the horse’s mouth as they can get irritated and try and bite you at this point. You check your stirrups to see if they’re the correct length, you do this by holding the point where the stirrup joins the saddle and pulling the stirrup out to meet your armpit. It should be the length of your arm ideally. Finally, for comfort, a thick sheepskin is put over the saddle, which is then fixed in place using a thinner leather belt that ties over the top of the lower belt. I’m not very good at mounting so that was quite fun! I also scored the most awesome leather helmet. I also found it amusing that we had been asked to rank our riding abilities on a scale of 1-5 so that they could select suitable horses to the riders. The people who had never been on horses before ended up with horses with great names, the tormentor and inferno… They definitely have a sense of humour in how they’ve named their horses! They actually bread their own horses here. They buy a new stallion every three years and usually have around ten foals per year. 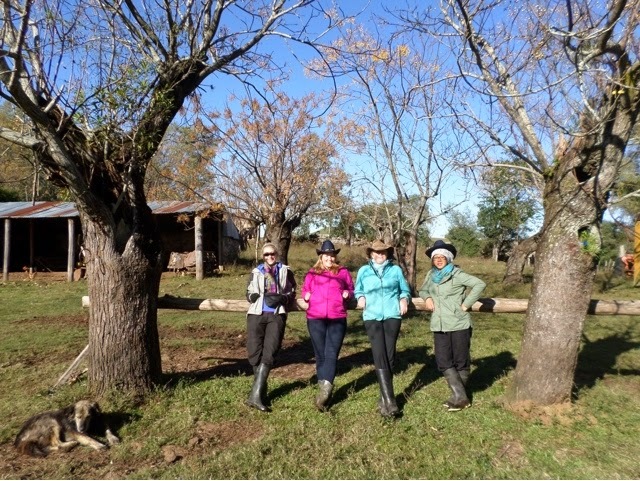 We all jumped on our horses and headed out to check out the land. Our first ride took us out across the paddocks. 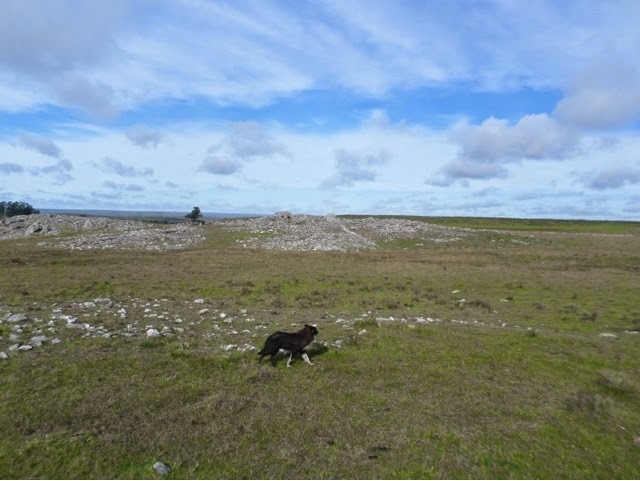 The land is fairly flat and rolling and looks like limestone country. It’s very green and reminds me a bit of the Peak District. 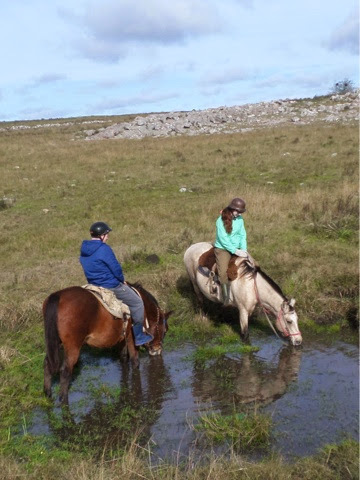 In some places there are lots of small rocks at the surface which the horses don’t like riding over and there are lots of streams and ditches, which were fun. 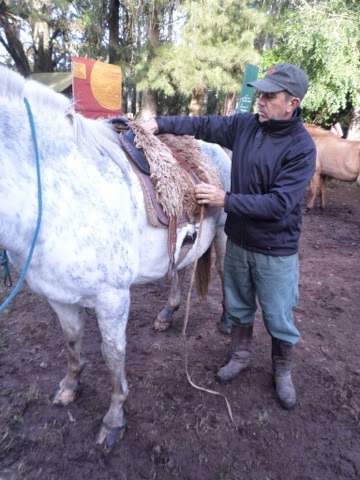 The aim of the ride was to get people used to riding in a gaucho saddle and used to using neck steering to control the horse. Gaucho style is similar to western style in that you ride holding both reigns in one hand and move both reigns together side to side or pulling to control your horse. It’s very simple really and becomes very intuitive so you stop even thinking about what you’re doing very quickly. Unfortunately one of my stirrups was ever so slightly too short for a while, before I got used to it and I ended up with a very sore shin, but I fixed it when we stopped for a break and gradually it eased off. That afternoon we headed out to try mustering for the first time. 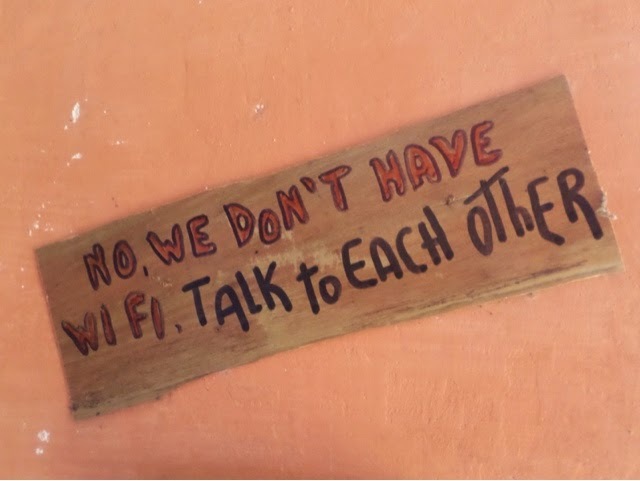 First of all Juan explained how we should go about it… It seems from some of the things he’s told us about previous visitors that they have had some interesting experiences with frankly stupid people! The key is basically to get behind the animals and drive them where you want them to go… Not complicated… In theory! Just so you understand… You want to be behind, to the rear, at the back… So where do we go? We headed out to a far paddock where a flock of sheep were grazing. It’s lambing season and we saw some tiny little lambs, pretty cute. The sheep all needed checking for foot rot, which they develop when they have been in wet conditions for long periods of time. We were very lucky with our weather as it had been raining for quite a long time before we arrived, as evidenced by the full creek and very boggy, muddy ground. We herded the sheep down into a series of pens to be checked out, you could see some of them limping due to the foot rot. The sheep pens, it’s amazing how many sheep you can get into such a small space! They were all herded into the large pen, we then moved them into smaller groups. They were then pushed into a small pen, checked by Juan and Bilinga for any treatment and released out the far side. It’s good fun trying to get the sheep to move around, you get trampled on a fair bit and you have to get fully involved. To move a bunch of frightened sheep you have to full-bodily grab them, or push their heads. There was a lot of bum slapping and pushing. I think some people were pretty nervous as they’re not used to handling animals and seem to think they’ll hurt them by touching them. I think I’m generally a pretty practical person with these things and I got stuck in and helped shove some sheep around :-). Also shouting loudly at them helps and it was interesting to hear all the silly things people were shouting at them… I stuck to vamos I.e. Move! 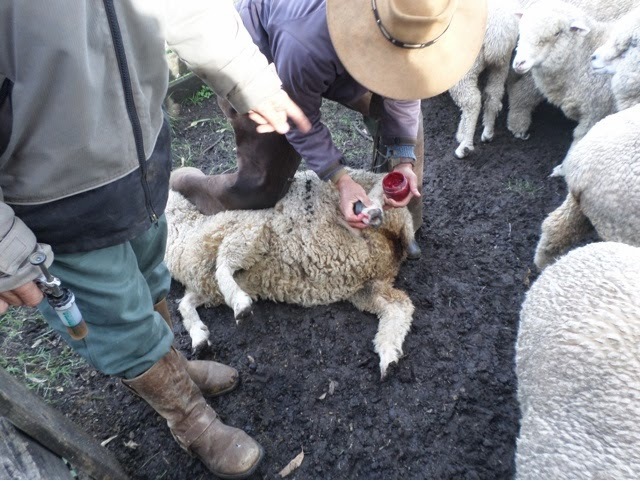 The sheep’s feet were checked out and where foot rot had set in Juan injected them with antibiotic. He’s actually a qualified vet. Where they had sores around their feet a red antiseptic cream was rubbed into it. There were also a few rams in the flock that had obviously been fighting as they had blood on their heads from head butting. From there we moved a herd of Cattle across into another field. Cattle mustering is definitely more interesting than sheep, the sheep are pretty well behaved. 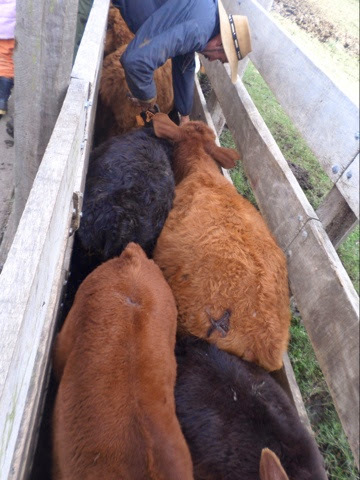 The cattle and their calves need a bit more help… We did a good job though and got them all through the gate easily enough. It was pretty good fun chasing them all down. The cows get a bit nervous crossing the streams and ditches, so you have to drive them onwards. You need to do this otherwise they start turning around and will try and head out in the wrong direction. Unfortunately again I think people found it made them nervous to get too close to the cows on their horses or they didn’t like pushing the cows as they made a LOT of noise in protest. One person even said they found it distressing, but things like that are definitely not for everyone. I loved it, it was great fun and pretty easy to be honest. 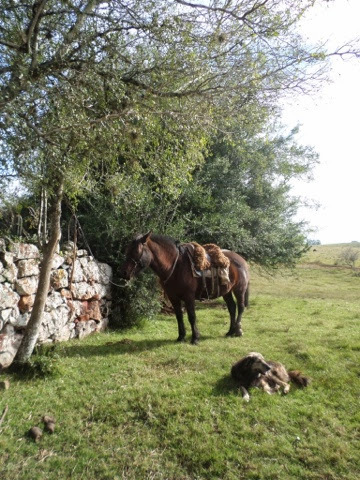 That afternoon I think Geruda was not feeling in the mood to chase down cattle as he definitely was putting up a fight to going where I needed him to. It was ok but harder work, as I’m not an experienced rider I did wonder if it was due to me doing something wrong, but I got a bit firmer with him and the rest of the day was easier. 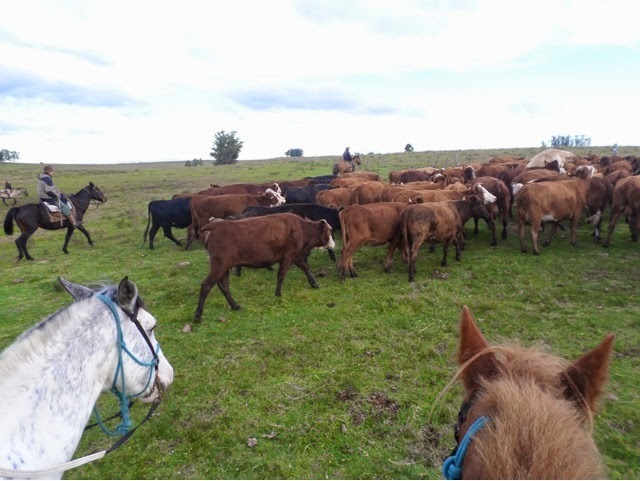 I think he just likes to be with the rest of the group whereas we had split into smaller groups to collect different groups of cattle into a single herd. In particular my horse likes Mark’s horse, a little bit too much actually and always wants to ride next to him, which made things interesting when we tried to ride them in different directions. For some strange reason when I was younger I was convinced I would wind up living on a farm… To be honest I think I would be very well suited to the lifestyle. I also love riding, it’s absolutely brilliant, and I think my parents should be glad I never got near enough a horse as a kid, or else I’d have been hooked! I am definitely going to check out riding more when I get home. Although to be honest the appeal of riding to me was more about riding out on the land, riding for shows or jumping doesn’t appeal in any way at all to me. 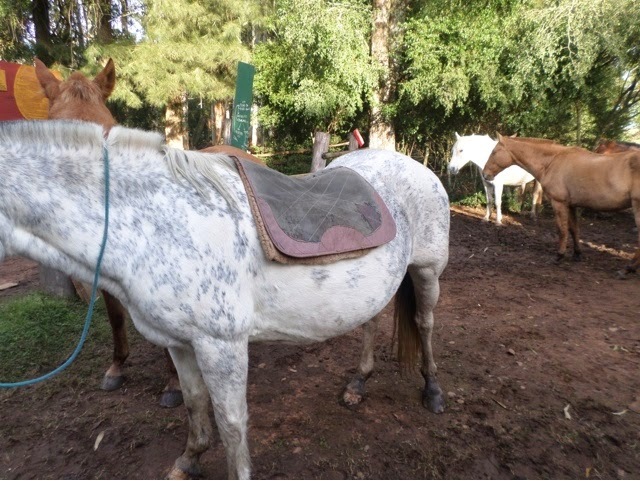 Juan said to me that he could see from the way that I am with the animals that he could tell I enjoy riding and loved the horses and that I should definitely continue… You can definitely see easily who is at ease and who is still nervous riding. 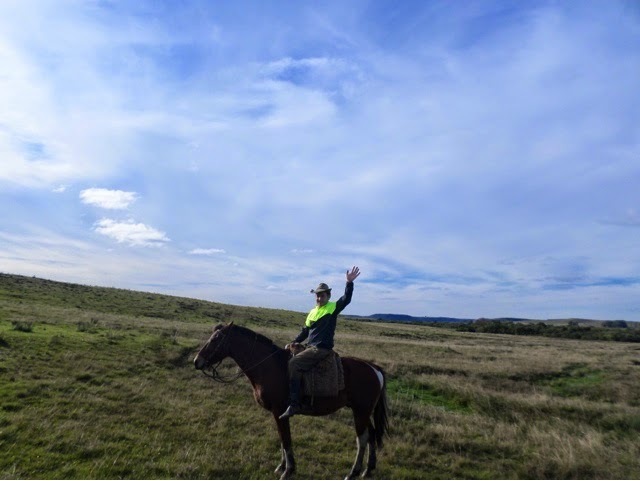 I was glad I was given a horse who was happy to speed off when wanted, as some people who were more nervous were given very slow placid horses, which I think I would have found fairly dull and frustrating after a while. We headed home and settled in for the night with a giant beef stew for dinner. We watched that Aussie classic ‘The Castle’ whilst the electricity was running and then headed off to bed. The second morning started with an awesome big breakfast of eggs. You can make your toast on the top of the range, like on an Aga, I always wanted to live in a big old farm house with an Aga. We then saddled up and headed out to move more cattle around. Bilinga’s horse and one of the farms dogs. You can’t take dogs out mustering when you have lambs or calves. With the lambs, they will all turn away from their mothers and follow the dog instead and it’s very difficult to get them to return. Calves tend to scare easily and the dogs upset the mothers who then become aggressive and will rush the dogs. 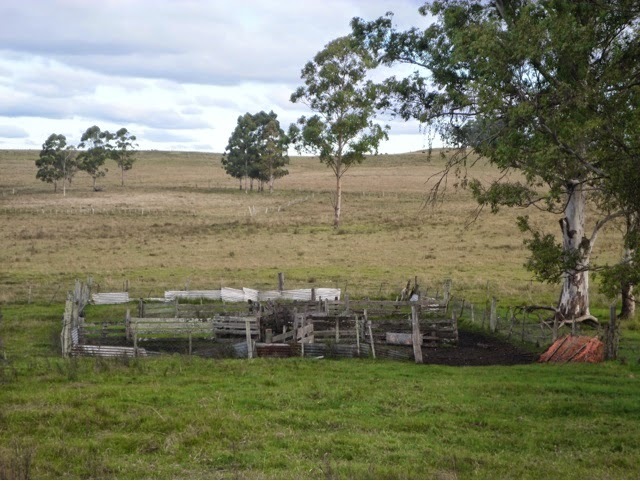 We drove the cattle across the fields, over a road and into a large pen behind the house. It took most of the morning to move them as they were pretty spread out to start with and needed moving quite a long way. As the group had a lot of young calves with them they also took a fair bit of work to keep moving. Several of the cows were fighting along the way too. We got them all down into the pen with only one break out, which happened during a stream crossing as we’d left too wide a gap and once one cow got through more thought it’d be a good idea to follow :-). After another great lunch of chicken stew and loads of salads it was time to go back to work, this time on foot. Some of the calves in the herd we moved that morning needed weaning from their mothers as they are growing too large on milk. Therefore we had to separate and brand some of them. 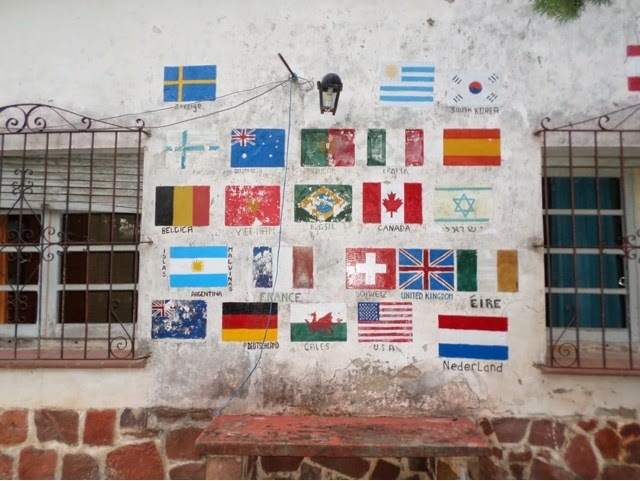 Each farm is given a different branding mark in Uruguay, which is set by the government. 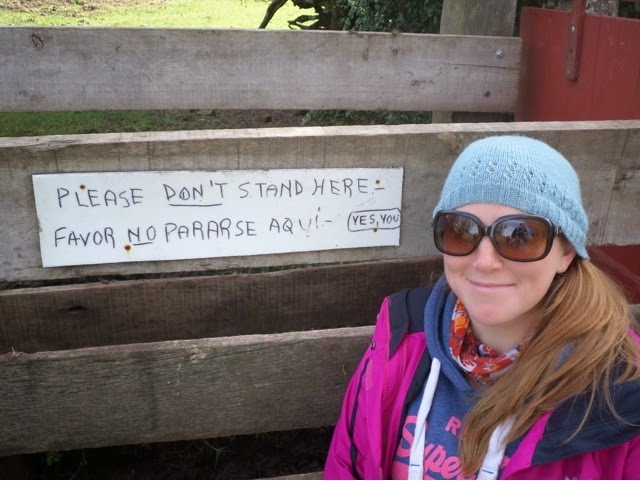 It’s actually a legal requirement that their cattle are branded here so they can tell where the cattle came from. The branding irons heating in the fire. 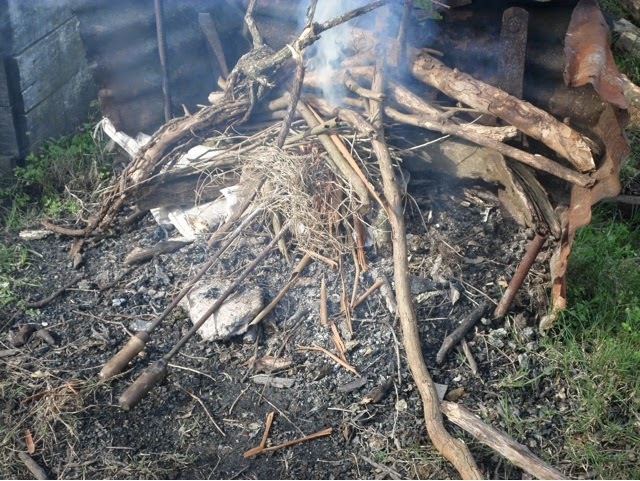 Not everyone in the group came to be involved in this activity as some people found the idea distressing and others objected to the use of branding. 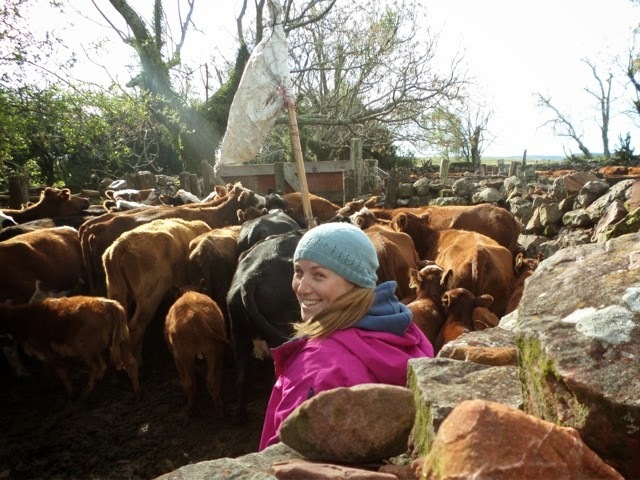 We were all given different jobs, Michelle was in charge of changing over the branding irons and passing them over to the Gauchos. First you have to separate out the cattle. This is easier said than done though! The cattle are moved in small groups into a small round pen dubbed the circle of hell. You move the cows using long sticks with white flags attached to the ends of them. You also have to give them a fair wack every now and again to get them going where you want them. Once the adults have been moved into the long narrow pen the gate is closed behind them, so only the calves remain in the circular pen. The adults are then released into a field on the right hand side as we don’t need to do anything with them. The calves are then moved into the same narrow branding pen. 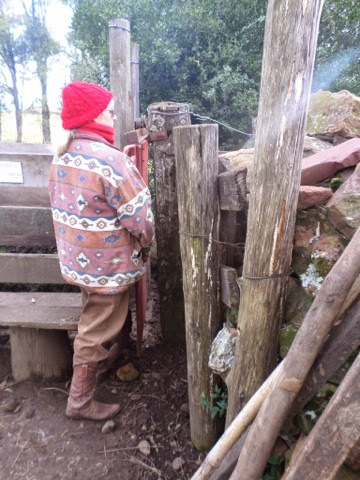 Jackie controlling the sliding gate that separates the long, narrow branding pen from the Circle of hell pen. The Gauchos then check all the calves. They are checked under their tails for sexing and they also have their right ears clipped. This is a shape specific to the farm and is a form of secondary identification. Juan was also injecting them against worms. The calves were checked for size as the smaller ones were returned to their mothers to be fattened up more. The larger calves were branded. 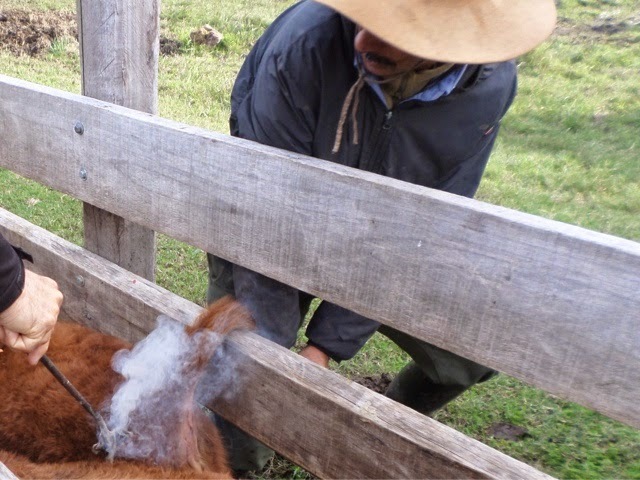 Bilinga would hold the calf still by their tail whilst Juan branded them. The smell was just like a burnt out hair dried, funnily enough. Branding is a fairly controversial topic in the west, although is still standard practice over here. Some people believe that it is cruel to the animals. 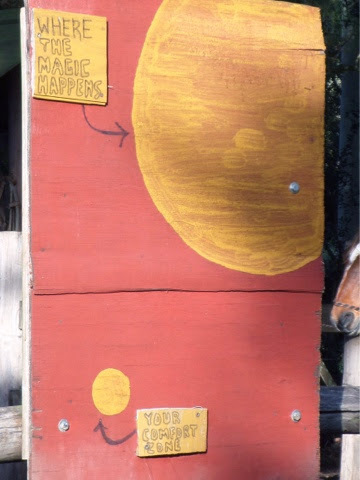 I asked Juan about this as he worked as a vet for many years prior to returning to the ranch. 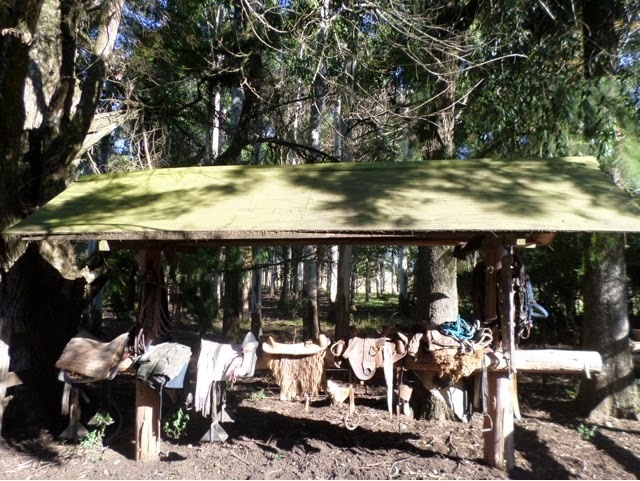 He reckons that cattle and sheep have very thick hides and in his experience don’t feel pain acutely. Therefore he thinks that branding is OK as it doesn’t cause any long term discomfort to the animals. However animals such as horses and dogs feel pain more acutely and need to be treated more gently. It’s interesting to hear his views as the ranch is a fairly small farm and you can tell that they have a real love for their animals. On the adult cattle you can barely see the mark as the hair grows back around it and almost entirely covers it. The branded calves were then sent off to a field on their own and the smaller calves were returned to their mothers. Separating calves and mothers is a very noisy exercise! The mothers will continue to look for their calves for three days and call out to them almost constantly. After the three days are up they come into heat, mate again and move on. The calves will cry for their mothers for seven days before they quieten down. They were separated so that the calves are the correct weight when sold. The farm raises their calves to 250kg, at which point they are sold on to another farm where they are brought up to 500kg before being sold to an abattoir. 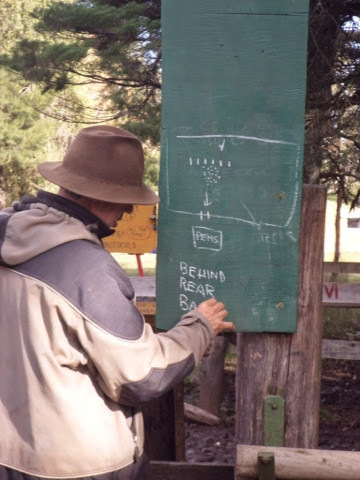 The ranch usually sells via an agent who co-ordinates between the surrounding ranches. The lambs are sold in the same way. Only the male calves are sold, the females are kept for breeding. Each female cow can breed for around 8-10 years. Once the cow is no longer fertile they are sold for meat. As this is lower quality meat it is usually ground and sold for mince or processed meat products such as burgers. That night we had our final evening meal and a gorgeous chocolate mousse before heading off to bed for the last time. Some people stayed up late. I was tuckered out as I’d been quite involved all day. The final morning was spent having a lazy breakfast and packing. We had a few rounds of badminton and other played basketball. I always went for a walk around to take some pictures, as it was yet another beautiful day and the location is very pretty. I also saw pigs 🙂 nice but smelly as you’d expect. An old tractor rusting away behind an outhouse. 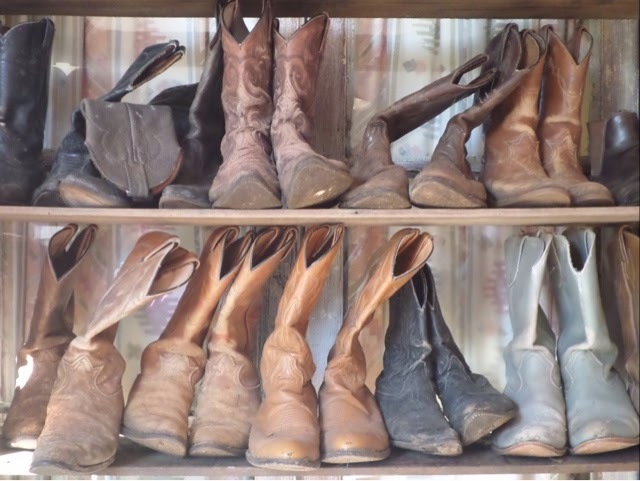 Then grab your boots… Mine were the dark blue ones top left, I loved them! Overall the farm stay has been one of my favourite experiences of my entire trip. It was extremely rewarding and I loved working outdoors and being with the animals, even when it was cold. It was also very interesting talking to Juan and Suzanna and learning more about how the farm works and about their lives there. Their family is beautiful and it was so lovely to meet little girls who still seem like children should be. I asked Suzanna about how the children will be schooled. They do have a local school but it is a bit of a drive away and it’s across a creek that can flood badly during the winter so they will have to see if it’s possible and of not home school. Definitely not the sort of issues parents at home have to worry out when choosing schools! That afternoon we loaded up the truck and headed back to the highway, where we were met by a small bus that took us up near the border. We had to jump into taxis to take us to the actual border crossing at Concordia. Once there we transferred to another bus that took us overnight up to the Brazilian border and into country number seven to the town of Puerto Iguazu. 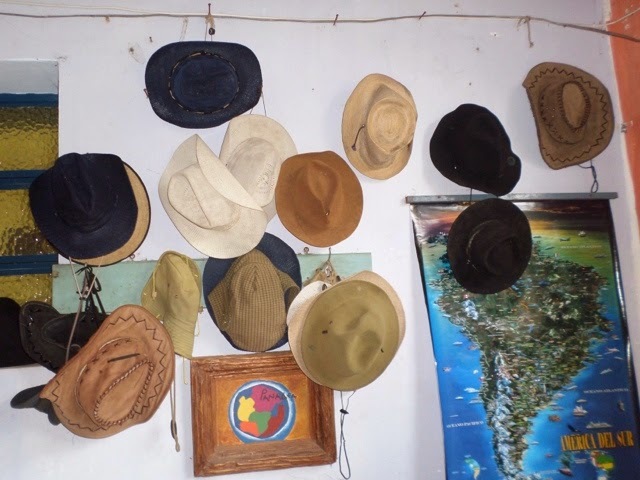 This entry was posted in Travel and tagged Branding, Cattle, Cowboy, Estancia, Farm, Gaucho, Herding, Horse riding, Intrepid, Muster, Ranch, riding, Sheep, South America, SouthAmericanAdventure, Travel, Uruguay. Bookmark the permalink.